A Womens Berlin: Building the Modern City | Free eBooks Download - EBOOKEE! Posted on 2010-02-06. By anonymous. Around the beginning of the twentieth century, women began to claim Berlin as their own, expressing a vision of the German capital that embraced their feminine modernity, both culturally and architecturally. Women located their lives and made their presence felt in the streets and institutions of this dynamic metropolis. From residences to restaurants, schools to exhibition halls, a visible network of women?s spaces arose to accommodate changing patterns of life and work. A Women?s Berlin retraces this largely forgotten city, which came into being in the years between German unification in 1871 and the demise of the monarchy in 1918 and laid the foundation for a novel experience of urban modernity. Although the phenomenon of women taking control of urban space was widespread in this period, Despina Stratigakos shows how Berlin?s concentration of women?s building projects produced a more fully realized vision of an alternative metropolis. Female clients called on female design professionals to help them define and articulate their architectural needs. Many of the projects analyzed in A Women?s Berlin represent a collaborative effort uniting female patrons, architects, and designers to explore the nature of female aesthetics and spaces. At the same time that women were transforming the built environment, they were remaking Berlin in words and images. Female journalists, artists, political activists, and social reformers portrayed women as influential actors on the urban scene and encouraged female audiences to view their relationship to the city in a radically different light. 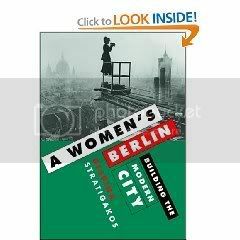 Stratigakos reveals how women?s remapping of Berlin connected the imaginary to the physical, merged dreams and asphalt, and inextricably linked the creation of the modern woman with that of the modern city. No comments for "A Womens Berlin: Building the Modern City".